Video converter for high and normal resolution videos: Converts video-DVDs and video files for a number of high-quality devices, among them Sony PS3, Microsoft Xbox 360 and Apple TV. CinemaHD Box Enlarge and improve your movies! 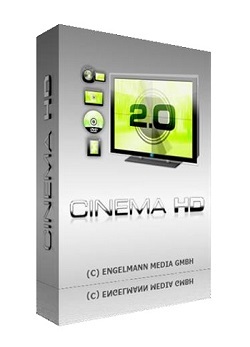 CinemaHD 2.0 is a revolutionary piece of software to enlarge and improve video files without employing expensive hardware or even more expensive professional studios. At the same time, it is also capable of producing output for the DVD player in your living room from videos made with your mobile phone, as well as creating High Definition video from a common DVD-Video. All this has been made possible by ODU – Object Detection Upscaling. A revolutionary method of reducing and covering scaling artefacts to an extent unreached with traditional methods such as Spline or Lanczos.